So don’t let the title of this post fool you. I usually make my “pumpkin” puree from a combination of sugar pie pumpkin, butternut squash, hubbard squash, or kubocha squash – pretty much any squash that the farmer’s at the market tell me will work. Why do I do this? Partially because of availability and quantity – some of these squashes (like the hubbard) are HUGE and will make a ton of puree. 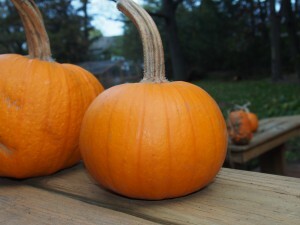 Some of these squashes are also lots cheaper than pie pumpkins. But it also helps to mix up the flavors and textures. A butternut is lots sweeter than pumpkin, but it is very wet. The hubbard is also really sweet, but it is comparatively dry. So when I mix a bunch of them together, I end up with an amazingly sweet puree that is not too wet or too dry. Do you ever want to eat pumpkin puree out of can? Me neither, but when I make homemade puree, I often find myself licking the spoon and the bowl – it’s so good. And isn’t that really what we want to be baking and cooking with? Cut squash in half and clean out seeds. Save those seeds! Sort them from the flesh. I like to soak mine in cold water for 1-12 hours. I guess this helps to get the sprouting process started which can help increase nutrition and digestibility – whether or not that’s true, I think they taste better soaked. Drain, rinse, toss with olive oil and salt. Roast in a 350 degree oven for 15 minutes until toasted. You can mix up your seasonings also – try cumin, chili powder, cinnamon and a little sugar or even a curry seasoning. Back to the squash – I’m going to give you two methods to cook it. In my opinion, they both end up tasting the same. Pressure cooking saves time and energy, but may not work if you are trying to do a huge batch. To roast in oven – Place squash, cut side down on rimmed baking pan. Add ½ cup of water and roast in 400 degree oven for 45-60 minutes until it is pierced easily with fork and starts to slump. Cool until it can be handled. To pressure cook – add 1 cup of water to pressure cooker. Cut squash into pieces and place into pressure cooker. Lock lid and bring to high pressure. Cook for 6 minutes. Release pressure naturally. Once squash is cool enough to handle, use a spoon to scrape out the flesh into a big bowl. I usually taste a little bit of each squash to make sure it tastes sweet. You can also taste the raw squash, if you are into raw squash. If it doesn’t taste good (and you’ll know it), then toss it. I know that hurts, but it’s better now than later when you’ve made an awesome lasagna with not so great squash puree. In small batches, puree the flesh in a food processor or blender until smooth. You can use the puree immediately, refrigerate for up to 5 days, or freeze. I usually freeze in 2 cup portions (same amount as a small can of pumpkin). Bags of frozen pumpkin puree can be thawed overnight in the fridge, or more quickly by submerging the bag in hot water for 15-30 minutes. Use this puree in pumpkin muffins, pumpkin bundt cake, butternut squash lasagna, pumpkin chili, pumpkin butter, and butternut squash soup. Yes, I know I should post my recipes for all of these great things. I’ll get to it. And then I’ll have a blog of entirely pumpkin things. Not the worst thing in the world, I know. If you have any great ideas for using pumpkin puree, please leave a comment below. I’d love to hear your ideas.